This year’s Cutting Edge of Mission was awarded to Dr. George Sabra. Dr. Sabra is a Professor of Systemic Theology and President of the Near East School of Theology (NEST) in Beirut, Lebanon who engages in reflection, research and discussion concerning peace, justice, human rights and inter-religious dialogue. His focus on promoting Muslim-Christian dialogue draws attention to the need to address religious extremism. Dr. Sabra reflected on the nature and causes of religious extremism, expressing his concern with overly simplistic explanations that reduce complex situations to a single cause. Instead, he expressed a need to confront religious extremism and dismantle it. He highlighted the critical role of women, developing a culture of self-reflection and fostering an environment of pluralism. 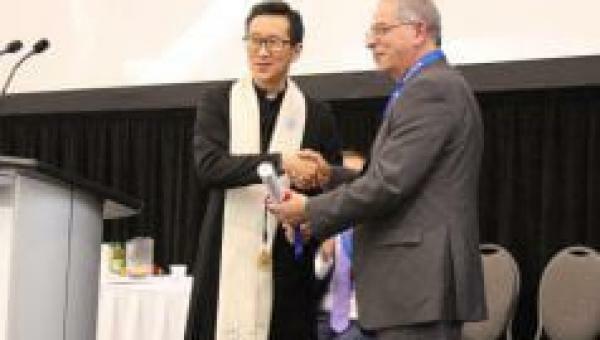 Recognizing those best placed to dismantle religious extremism are those within that religion, he explained how the Near East School of Theology is playing a facilitating role to confront Islamic extremism.